Hope Above Racial Discrimination and Social Support in Accounting for Positive and Negative Psychological Adjustment in African American Adults: Is “Knowing You Can Do It” as Important as “Knowing How You Can”? 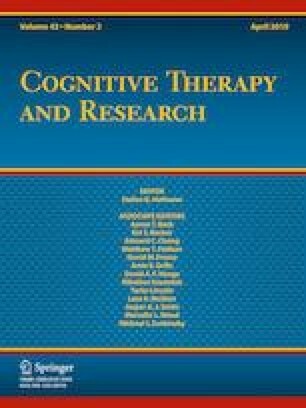 In the present study, we examined the role of racial discrimination, social support (viz., family and friends), and hope (viz., agency and pathways) in accounting for negative psychological adjustment (viz., anxious and depressive symptoms) and positive psychological adjustment (viz., vitality and life satisfaction) in a sample of 249 African Americans. Overall, results of conducting a series of hierarchical regression analyses provided some evidence for the role of racial discrimination and social support in accounting for both negative and positive psychological adjustment. Noteworthy, the inclusion of hope was found to significantly augment the prediction models of psychological adjustment. Within the hope set, agency was consistently found to uniquely account for adjustment. In contrast, pathways was only found to uniquely account for vitality. Beyond affirming the importance of racial discrimination and social support, the present findings highlight the added value of considering hope, especially agency, in understanding positive and negative psychological adjustment in African Americans. Implications of the present findings for understanding the role of racial discrimination, social support, and hope in the psychological adjustment of African American adults are discussed. There is in this world no such force as the force of a man determined to rise. The first author would like to thank Chang Suk-Choon and Tae Myung-Sook for their encouragement and support throughout this project, and to acknowledge the late C. R. Snyder for sharing his passion for the study of hope in the lives of all people. Edward C. Chang, Olivia D. Chang, David Rollock, P. Priscilla Lui, Angela Farris Watkins, Jameson K. Hirsch, and Elizabeth L. Jeglic declare that they have no conflict of interest. All procedures followed were in accordance with the ethical standards of the Institutional Review Board at the university where the study was conducted. Informed consent was obtained from all individuals participating in the present study. American Psychological Association. (2016). Stress in America: The impact of discrimination. Stress in America™ Survey. Retrieved from http://www.apa.org/news/press/releases/stress/2015/impact-of-discrimination.pdf. American Psychological Association. (2017). Multicultural guidelines: An ecological approach to context, identity, and intersectionality. Retrieved from http://www.apa.org/about/policy/multicultural-guidelines.pdf. Henry J. Kaiser Family Foundation. (2014). Population distribution by race/ethnicity: Timeframe 2014. Retrieved from http://kff.org/other/state-indicator/distribution-by-raceethnicity/.